SEO doesn’t have to be difficult, but it’s not magic. You just need a great strategy that works. Why reinvent the wheel when you can use our proven SEO strategy and double your traffic in just 1 month. Is the strategy right for you? Are you unsure how to reach a bigger audience? You’ve tried everything you know how to do, but can’t seem to grow your blog or get more traffic. Spending too much time for too little results? You’re writing posts, promoting your content, and engaging on social media, but not seeing much growth. Frustrated by conflicting information about SEO? You’ve seen so many different SEO tips that you’re not sure what to think anymore. You Need Our 5-step SEO Strategy! If you want to stop wasting time on one idea after another, we invite you to copy our strategy. We know what works. This 5-step strategy is exactly what we use on all of our blogs to rank on the first page of Google and get more traffic. Stop spending your precious time on techniques that don’t work. You can buy a guide that tells you what SEO is, leaving you even more confused than you were before. Or you can buy this guide that SHOWS you how to make SEO work for you, step-by-step. What is the Complete SEO Strategy? 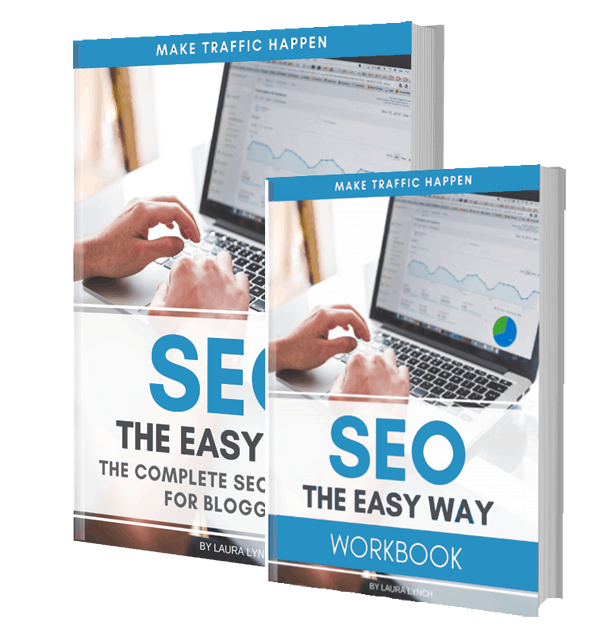 SEO the Easy Way is a bundle of two great resources. It includes our Complete SEO Strategy to help you understand all of the important principles involved in SEO and it includes a FREE workbook that will help you apply each principle to your own website. What are you waiting for? Get started generating more traffic today! 117-page guide explaining your new, easy 6-part SEO strategy. 6 sections packed full of important SEO techniques. Learn how to be the answer, plus perfect your keyword research, on-page, off-page and technical SEO. 52-page comprehensive workbook with interactive checklists. How to implement the Complete SEO Strategy on your blog. If you need step-by-step instruction, this workbook is your new best friend! Google’s #1 goal is to provide the very best answer to every search. To rank on the 1st page, you have to provide that answer. Writing content no one is looking for is a waste of time. You shouldn’t write a single word without researching keywords. Google looks for specific signals that show them your content is worthy of ranking. Adding these signals is your top priority. Learn exactly how to implement the Complete SEO Strategy on your blog with our 52-page interactive workbook with questions and checklists. Step-by-step instruction to help you implement the strategy right now. In October I saw Gemma Armit and Laura Lynch talk about SEO at TBEX and it blew my mind. I bought their SEO guide and started implementing their strategy. At the time I had 3.5k views, 5 months later I just hit 25k views (that’s a 614% increase). The Complete SEO Guide is a must read for all new bloggers as well as experienced professionals who want to up their SEO game. The author filled the guide with handy SEO tips and tricks without using complicated, technical jargon. My only complaint is that she didn’t write the book sooner! This is a great SEO guide and I wish I had it when I first started blogging. Each aspect of SEO is explained in easy to read and straightforward language. Highly recommended if you are looking for an easy-to-follow guide to boosting your blog’s search traffic. I found the Complete SEO Guide extremely useful and would say that it’s equally suited to beginner or experienced bloggers and website owners. The step by step examples make everything easy to understand and to implement. All in all, a very handy tool for anyone looking to up their game with SEO. I should be the one cheering, I FINALLY understood so many things that none of the other books covered, and being specifically related to travel blogs, it had also an easier approach. It’s been the best money spent since when I’ve started blogging! I have a much better understanding of SEO. It is by far the best resource I have found on the subject.It’s not free but if you don’t understand SEO it is the clearest instructions I have ever read. I bought this guide – just want to encourage anyone if you don’t win it go buy it – BEST thing I ever bought I have to say. I have spent a lot of money to get better at this blogging game from people who claim to be experts, but yours is hands down the best. WANT MORE WAYS TO KICK YOUR SEO UP A NOTCH? Sign up for our mailing list to receive valuable SEO tips and techniques!